AutoGuide discovered Daimler applied for an international trademark for the alphanumeric "C 53" at the World Intellectual Property Organization. The hot gossip is that Mercedes-AMG will eventually introduce such a model, the question is whether that model will slot between the AMG C 43 and AMG C63, or replace the C 43. In terms of pricing and power outputs, the C lineup has room above the 2019 C 43 with 385 horsepower and 384 pound-feet of torque that will start at a little more than $53,400, and the $66,100 C 63 with 469 hp and 479 lb-ft. However, adding a third output would be a first for the brand in the U.S. – no other Mercedes series production model has more than two AMG variants. Such a move would also break with the precedent established by the introduction of the AMG E 53, which supplants the two-year-old AMG E 43 when it goes on sale later this year. We'd expect a C 53 to use the same 3.0-liter single turbo inline-six from the E 53 and CLS 53, paired with an electric compressor and 48V electrical system powered by the starter/generator, and the EQ Boost electric motor mounted between the engine and transmission. Total output in those larger cars comes to 429 hp and 384 lb-ft run to all four wheels through the 4Matic+ system, with the EQ Boost providing another 22 hp and 184 lb-ft on heavy demand. AMG's nine-speed Speedshift TCT 9G torque converter automatic sends power to the wheels. 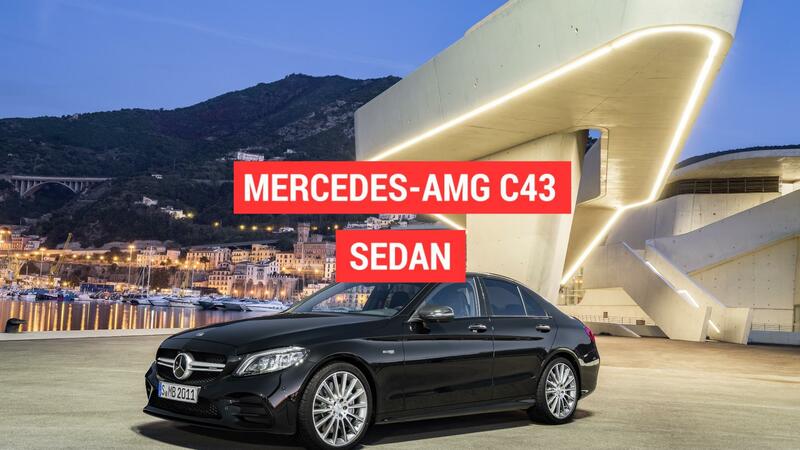 We wouldn't be surprised to see a C 53 model downtuned slightly; the C 43 has remained less powerful than the E 43. No matter which way the lineup goes, we'd expect no real cosmetic changes. A C 53 is likely to be identified by more chrome accents throughout, such as chrome tailpipes.